The much anticipated journey of our trip – Manali to leh drive – started with the entry of Bittu bai. Annavru’s relative and since he was very small built we named him sannavru !. We started our journey by 5AM with a bad coffee treat from annavru. We bid goodbye to him and promised to meet him the next time we visit Manali. He asked us to call him and inform soon we reach our destiny. The way from manali to leh is one of the most fascinating routes and travelers’ paradise. This route is called Biker’s mecca. Every adventure biker’s biggest dream. The journey is divided into 3 parts. Manali – Rothaang pass, Rothang pass- sarchu, sarchu – leh. Only the first part is accessible through out the year. If there is heavy snowfall it is not possible to go up till rothang. The later two parts are accessible only between mid july-mid September when the snow melts. The route till rothang pass is full of snow and cloud clad mountains, water falls and streams. The road is very narrow with a thousand feet drop on one side and steep hill on another side. We found many streams crossing the roads. We stopped at a place called “Maddi” for breakfast. It is a small village with a few dhabas located at almost a no man’s land on top of a mountain. The density of air had already reduced and one of my friends fell sick and developed severe headache. We then reached Rothang pass. It is located at about 16000 ft above sea level and one of the most beautiful places of himachal Pradesh. “Rothang” means “pile of dead bodies” and “pass” means “valley”. In the past this was the only route that connected a part of china to India and its terrible weather used to kill many travelers and hence the name “Valley of the dead”. This place is covered with snow most of the year and is accessible for only 3 months an year. This is one of the most photogenic places of Himachal. After a brief photo session we continued via Keylong and stopped at a place called “Darcha”(28 km from keylong) for lunch. The menu had noodles and bread-jam. Do REMEMBER to refuel your vehicle here. There are no fuel stations for the next 380 kms! After Darcha, we were greeted by a small yet posh village called “Sissu”. The entire village of sissu was buried due to a land slide during 1960s which killed everyone except a few who has rebuilt this village to its past glory. The view from this village is very pleasing as it is entirely surrounded by mammoth mountains, a huge waterfall, a lake and garden like fields. Then comes a small lake called Suraj Tal – The birth place of the river Bhaga. The water in the lake is very pure and the reflection of blue skies and snow clad mountains is mesmerizing. A couple of kilometers ahead is the famous Bara-lacha-la (also known as Bara-lacha Pass, el. 4890 m./16,040 ft.) – one of the highest motorable passes in the world. We took a few photos of this place and headed to a small village of 20 people called Bharathpur where we had evening tea. Finally we came to Sarchu at around 6PM. Once can find many tents put up for visitors on one side of the highway. We got down at the very first one, negotiated the price(800 per tent) and dumped our bags inside. The evening walk at Sarchu was made memorable by panoramic view of a vast plain land walled by mammoth mountains painted with million colors by the setting Sun. A few fell prey to AMS and hence slept in the tents while rest of us walked till the trench where we could see the river Indus. Mercury drops below zero once night sets in and we were forced to stay inside the tent. It even rained chickens and piglets during night  Even though one won’t feel very cold inside; acclimatization is difficult due to low oxygen levels. 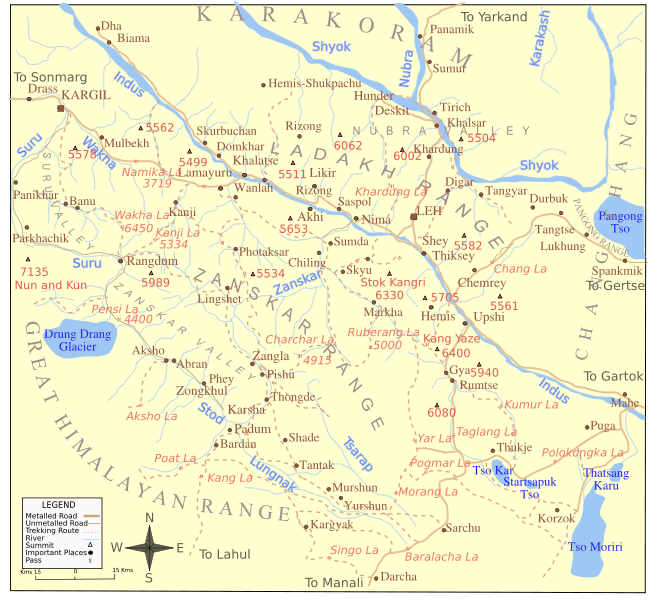 Jammu and Kashmir border is just 2KM from Sarchu. The drive from here is exiting as well as horrible (because of bad road). We pass through Nakula(15500 ft) and Lachungla(16500 ft) passes. One get to see a few army camps on the way. This route goes alongside river Indus till Pang. We stopped at Pang for lunch. Pang is again a small village with a few(5-6) tents. Every tent is hotel which serves tea, noodles, bread, chips and a few other things. The grocery for this village is supplied by the army vehicles which pass by. Half an hour after we left Pang, we were almost asleep and suddenly our bittu bhai accelerated the vehicle like an F1 car. We woke up by this sudden change of pace and to our astonishment there lay a long stretch of straight muddy road that bisected a huge plain land that seemed like the biggest playground on Earth. We stopped the car in the middle of the stretch and got down to take photos. The deserted snow capped mountains looked like jam packed audience cheering us with their silence. Pepped up by the view, we raced ahead to the other end of the track leaving behind a long trail of dusty cloud. We passed through the Tanglang La pass, the second highest motorable road in the world(approx.17800 ft). After a car wash at a small village Upshi we slept throughout the drive and woke up only when we were on the outskirts of Leh. We drove to “Leh 422-Army camp” where Our stay arrangements had been made by the Army at one of their guest house. The guest house was named “Nubra” and had a beautiful view of Leh and airport. We were greeted by subeidar Ranbir Singh who arranged for our medical check up. Evening tea and dinner was taken care of by our appointed sahayak Tarun. We spend rest of the time watching TV or roaming around within the Army camp.